You played with it for hours on end after it was first released, but by the time The Force Awakens hit theaters months later, you had probably lost interest in your Sphero BB-8. But don’t bury the little droid in a drawer just yet, because a free app will make your BB-8 even more exciting than the day you first opened it. The biggest fad in the toy industry right now is the STEM (science, technology, engineering, and math education) movement, but that’s not necessarily a bad thing. It was started as a clever way to introduce kids to intimidating educational topics through the use of fun toys and games. Kids have the opportunity to discover that challenging fields of study can actually be quite enjoyable, and it’s led to a boon in educational toys. The problem is that many toymakers have latched onto STEM as merely a buzzword to throw around in marketing materials, when in reality the toy has little educational value. Is a preschooler really going to learn how to code by connecting the pieces of a giant rolling caterpillar together? That’s debatable. But Sphero, makers of BB-8 and the original remote controlled ball that the droid toy was built on, have wholeheartedly (and properly) embraced STEM with an impressive app environment revealed a few months ago. The SPRK Lightning Lab app (available for Android, iOS, or other devices) allows anyone to write custom programs for Sphero’s rolling ball with an impressive amount of control and access to the toy’s capabilities, but with an approach that won’t frustrate amateurs, or limit experienced developers. Back in August of last year the Sphero SPRK Edition—a clear version of the rolling ball toy that reveals all of the electronic components that power it—was announced and made available to schools who wanted a more engaging approach to programming through robotics. But here’s the not-so-secret about the SPRK Lightning Lab app: it works with all the toys that Sphero currently sells—including BB-8—and it’s free for anyone to download and use. You can still control and steer BB-8 around using touchscreen controls in the SPRK Lightning Lab app, but you won’t have access to all the sound effects or other special features that are included in its own app. That’s OK, though, because those will all soon be forgotten once you start playing around with the powerful drag and drop programming capabilities of the SPRK app. When it comes to robots, Sphero and BB-8 are admittedly limited in terms of what they can actually do—at least compared to something like ATLAS. But thanks to an array of sensors (including a gyroscope and accelerometer) packed inside the plastic balls, and precision-controlled motors, there’s a surprising amount of control and flexibility within the SPRK app when it comes to not only programming how Sphero, Ollie, and BB-8 move, but also how they react to their environment and obstacles. The whole point of a STEM toy is not only foster learning, but to also allow a child’s skills and knowledge to grow while they play. The graphical drag and drop interface of the SPRK Lightning Lab app is a tried-and-true approach to introducing someone to the intricacies and logic of coding, but at some point it will become limiting. So the app also allows users to manually edit the OVAL code which is the underlying programming language that powers Sphero, Ollie, and BB-8. Users can quickly jump back and forth between the raw code and the graphical layout of their program, which can often help make it easier to understand what’s going on, and sometimes even what’s going wrong. 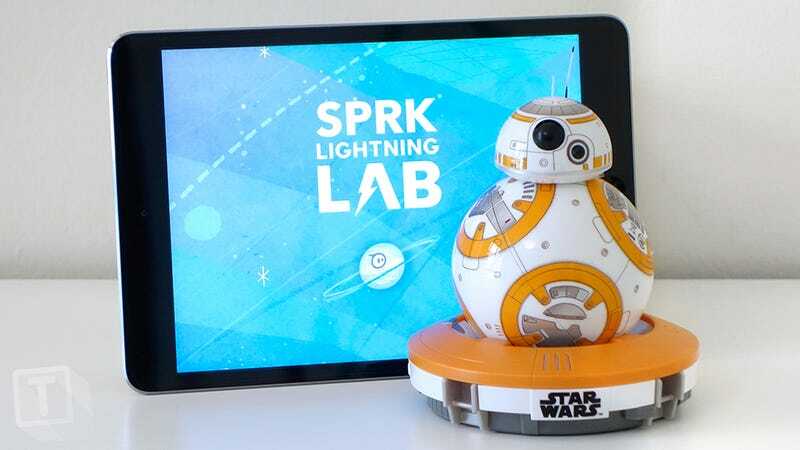 The SPRK Lightning Lab app will even appeal to those who have no desire to learn how to code or program, but are looking to squeeze some more replay value from the BB-8 they spent $150 on. The app provides access to an ever-growing community of Sphero hackers who have uploaded and shared their custom programs for anyone to download, dissect, and modify as they see fit. The programs vary in complexity. Some simply give BB-8 the ability to liven up a party as a rolling, flashing disco ball, while others turn the droid into a color-coded Magic 8 Ball that can detect and make a prediction whenever it’s thrown into the air, using the built in accelerometer. The community is a great way to discover new ideas and techniques for programming BB-8, and can be a valuable resource if you’re stuck on a problem and need a little inspiration, or a different approach. If you need any other reason to download and try the SPRK Lightning Lab app with your BB-8, just remember that Sphero designed it to be an educational tool for schools to help introduce kids to programming. So every time you upload a program you’ve tweaked to perfection, you can feel good about helping the children of tomorrow learn a valuable skill—in addition to having a great reason to play with BB-8 again.